IMPASUGONG, Bukidnon – Communist Party of the Philippines – New Peoples' Army terrorists (CNT) couple with their two children, voluntarily surrendered to the 8th Infantry Battalion (8IB) bringing along three (3) M16 rifles in the morning of November 18, 2018, in Impasugong, Bukidnon. 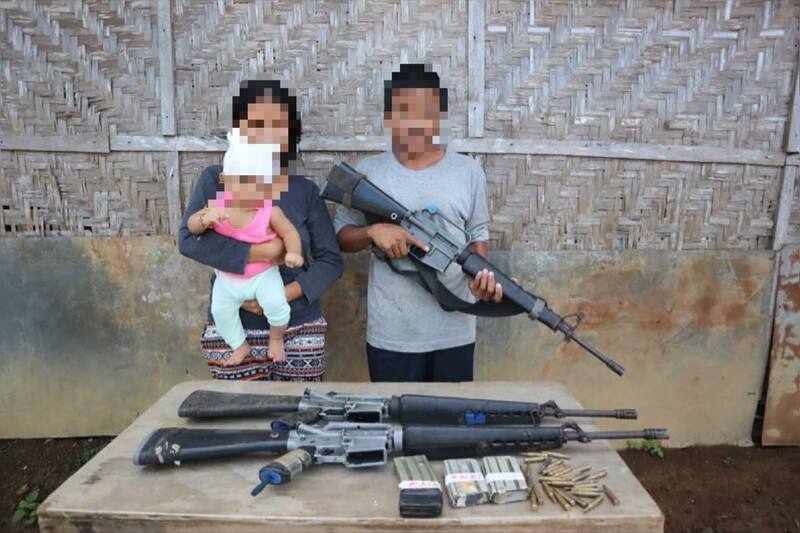 The former CNTs were identified as certain alias Alay/Cans/Batcom, 28 years old male and regular NPA member, and his wife alias Peme, 26 years old, a medic of the terrorist group. The couple said they used to be operating in the hinterlands of Cabanglasan, Bukidnon. "We are tired of running away from the government forces and we can no longer endure being cold, the lack of food and frequent movement in the forest with my 6-year old daughter and 4-month old son to evade pursuing Army forces. So we decided to return into the government bringing along three firearms which I consider as the instruments of violence used by the NPA in murdering innocent lumads," said alias Alay. The couple brought with them three M16 rifles and 1 long magazine with ammunition during their surrender. 403rd Infantry Brigade (403Bde) newly installed Commander, Colonel Edgardo De Leon, who Co-Chairs the Bukidnon Enhanced Comprehensive Local Integration Program (ECLIP) Committee, assures that the units under 403Bde will assist the surrenderees in their enrollment to ECLIP and help them be reintegrated back to society. "Alay and Peme, you made the right decision. Your children are now assured of a better future, now that you have rejected violence and embraced peace. The government will assist your reintegration back to our society. Moreover, to the remaining NPA terrorists who are thinking of going back to the folds of the law, I assure you, 403Bde units in Bukidnon and Misamis Oriental will help you in your enrollment to ECLIP," said De Leon. On the other hand, NPA couple admitted that they experienced unfair practices and frequent misunderstanding among the higher CNT leaders. It also added to their decision of leaving the terrorist organization. "NPA terrorists are now heeding our call to surrender. They have already seen the rotten system of the NPA terrorist organization. Good thing that this couple thought of their family’s future above the NPA terrorists’ failed ideology. With their decision, they will be able to experience the joy of togetherness this Christmas season, the start of a life away from chaos, hunger, and fear of losing their lives in an encounter with the government troops who are continuously conducting security operations," Major General Ronald Villanueva, Army’s 4th Infantry Division Commander said.